It's been quite a ride with Macross Frontier in last 6 months. What I thought was a mediocre anime at best turn out to be the best of the season, possibly best of the year. Having said that, I do want to make a note that they (the story writer) seemed have gotten over their head a little bit. But when you're writing a story as impactful as this, it's really hard not to get over your head towards the grand finale. So, I probably wouldn't hold that against it. Early in the series, I've made comparison between the original Macross and Macross Frontier: they looked quite alike early on. In fact, there's almost a one-to-one mapping of the major characters between those two. Macross Frontier also kept the same music-drama-action format as the original. But with a much more complicated storyline, and more advanced technology, Macross Frontier became much more than the original. Now, back to the mecha anime issue. I don't like mecha animes. There are many things in Mecha animes I don't like, one of them being that most mecha animes tend to be too obsessed about the technological advancement about their mechas. While I don't have too much of a problem with it, I just don't like a story build around that. Macross Frontier is different. Instead of building a story around the imaginary technology, they build the imaginary technology around the story. I like it much better this way because it's story centric. Also, there was an unexpected tragedy tossed in for an added bonus. *Edit*: After seeing the end of RD Sennou Chosashitsu, I feel that in Scifi anime category, RD Sennou Chosashitsu is the absolute best in 2008. 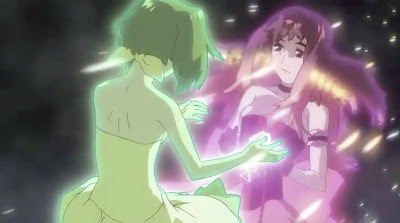 Even though I still love Macross Frontier as a Scifi anime very much, I would not hestitate remove the crown of Best Scifi of 2008 from it and place it upon RD Sennou Chosashitsu. Yes, it is that good. Recommendation: If you have not seen it, go download and watch it now. I don't think anything else in 2008 could top it.